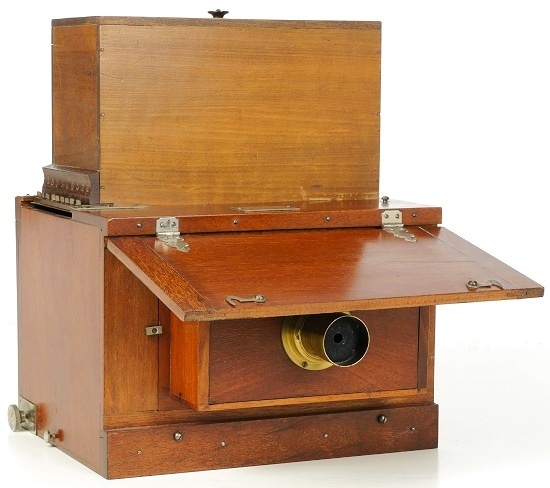 The Tourograph was envisioned by Thomas Henry Blair as a complete, portable photographic system. Originally introduced in 1878, the first Tourograph was an outfit containing everything needed (including the chemistry) by amateur field photographers to expose and develop wet collodion plates. As with many earlier builders of photographic apparatus (e.g. C.G.H. Kinnear), Blair's working experience as a photographer (from 1873 on) gave him insights about the practical needs of the craft and camera design. Early on, Blair relied on the American Optical Division of the Scovill Manufacturing Company to produce and market the Tourograph, but later formed The Blair Tourograph Company to control all aspects of designing, building, and marketing. The wet plate Tourograph was Blair's first camera. It was an open wooden box with a camera mounted on top that included a dark cloth instead of a bellows. Because the new company was formed at a time when the wet collodion era was ending, Blair shifted design and production of his Tourograph system to work with dry gelatin plates. THE BLAIR TOUROGRAPH CO. was organized for the purpose of introducing the Tourograph, and arranging photography in such a manner as to enable the amateur to enter into the pleasing part of its practice, without the great amount of study and expense which has heretofore been necessary; also, to foster the desire which is daily growing more intense to take photographs. For field use, the Tourograph is secured onto its tripod, the lensboard reversed and mounted, and the platebox lifted from inside the body and repositioned on top. A pair of brass mounts located at the top of the platebox accepts a viewfinder (if it wasn't already lost). A brass knob on top of the platebox provides a secure grip to help raise and lower the assembly. A dry plate version of the Tourograph system may have appeared sometime during 1880. Although both wet and dry plate versions shared the Tourograph name, they were completely different designs. By the end of 1881, Blair moved the company to Boston and renamed it as the Blair Tourograph & Dry Plate Company to better represent the range of products being produced and sold. 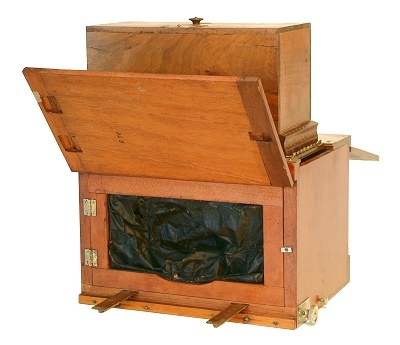 Three versions of the dry plate Tourograph were produced; and all shared Blair's vision of a portable system for amateurs built around a moderate sized wooden body that held a platebox of dry plates, lens, and means to change and expose plates without a darkroom. The camera was only in production for about 3 years and was probably replaced by the Lucidograph in 1883. Versions included a 2-door model (c.1880-81), "Improved Tourograph (1881 only), and a single door model shown on this webpage (c.1882-83). All versions were available in 4x5, 5x7, and 5x8 inch formats. Although there were many citations and testimonials, as well as one children's story mentioning the Tourograph, oddly only four cameras exist in collections today: a wet plate model in the Smithsonian patent collection, two 2-door models (one residing in the George Eastman House Collection), and a sole example of the single door model. No examples of the improved Tourograph have been identified. In 1881, the 4x5 model held 6 plates and sold for $20 while the larger 5x7 and 5x8 inch versions held 8 plates each and were respectively priced at $25 and $28. Each "system" included a single achromatic lens, tripod, a copy of the "Amateur's Guide Book," and memoranda book. An 1882 catalogue with the Washington Street address lists versions of the Tourograph as Nos. 1 and 2. No.1 is made of highly polished mahogany with "elaborate nickel mountings" while the No.2 is "plain." Later catalogues with the Tremont Street address no longer identified model numbers and simply referred to Tourographs by their format size. Blair's design approach was to encase all components within the wooden camera body, a design concept that was eventually refined in 1883 by Frank Pearsall and then widely adopted in the 1890s as leather covered, red bellows self-casing cameras. Unlike these later self-casing cameras, casing a Tourograph required removing the lensboard and top mounted platebox. However the process was simple. The lensboard is reversed with the lens stored inside the enclosure and the plateholder box set into the body as shown below. The single door (or 2-doors) enclosed the lensboard and lens. Portability was one of the key benefits. The Tourograph, in a sense, can be considered an early form of self-casing camera (predating the 1883 Pearsall) in which all delicate body parts are enclosed and protected within the body. This is accomplished by reversing the lensboard then dropping the platebox into the body as shown in the left image. A wood panel slid in place to close the opening (far right). Although the Tourograph is considered one of the first portable, self-contained cameras for amateurs, Blair's design ended up being needlessly complex for daily use. Unlike field view cameras of the day that had swing-away ground glass frames and simple methods to mount plateholders, Tourograph users had to learn a tedious sequence of steps to compose and shoot a single plate. Ironically, barely a year after the Tourgraph stopped being produced, a little known photographer by the name of George Frank E. Pearsall would create a self-casing camera design that would set the standard for portability. But his design would not take hold for another seven years. Yet as the 1880s ended, Blair and other builders continued to chase the amateur market with technically complex cameras. Even as Blair's hopes rested on the innovative Lucidograph as the simpler, smaller replacement to the Tourograph, it too would end up as an evolutionary dead-end. The Tourograph approach to photography sacrificed simplicity for portability. Raising the hinged rear panel reveals a fabric changing sleeve set into a swing-out wooden frame; allowing photographers to safely lower and raise a ground glass or plates by hand. To compose and focus, a ground glass (usually in platebox slot 1) is dropped into a wooden frame inside the camera body. The sleeve and its frame is then swung to the side to view the ground glass and focus a sharp image. Because the internal wooden frame must be moved out of the image plane of focus to load a new photographic plate, a temporary mark is made on the brass distance strip. To keep everything orderly, Blair created an indexing system to ensure that the wooden frame aligns with any of the nine platebox slots. A second brass strip embossed with nine corresponding hash lines serves as a guide. The photographer turns the focus knob until the desired plate's hash mark butts up to the body. The images to the right illustrate how the brass strip index corresponds to a platebox slot. 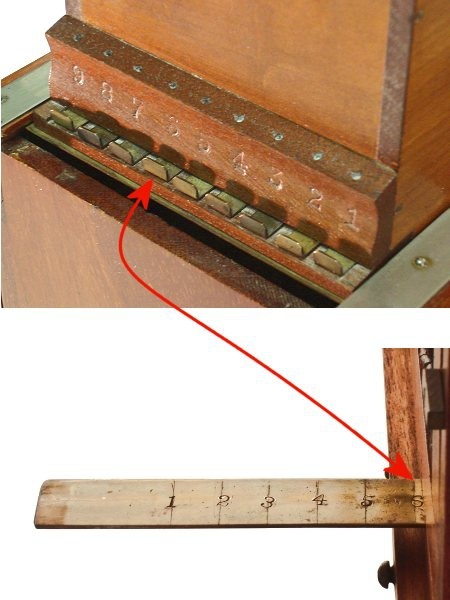 The matching numbered brass slide is then pulled outward and the plate gently guided into place using the fabric sleeve. Finally, the unexposed photographic plate is moved back into the image's focus plane by returning to the reference mark on the brass distance strip. Much to the delight of photographers, the process is repeated for each new picture. AMERICA'S FIRST DRY PLATE MAGAZINE CAMERA? Although not widely known, the Tourograph represents an important step in the evolution of self-casing cameras. As dry plates became more sensitive, builders refined camera designs into smaller forms. 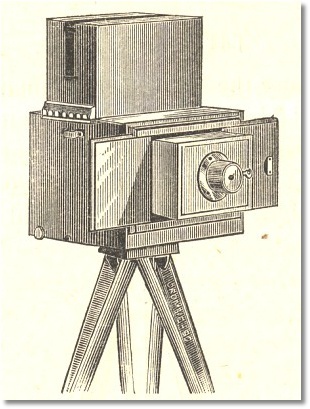 Blair may have recognized this and elected to cease Tourograph production in favor of the Lucidgraph; a view camera that folded into a smaller form. Ironically, the Lucidograph was also short-lived and eventually replaced by more traditional body patterns. While doing research, Todd Gustavson, technology curator at the George Eastman House, shared his opinion that the Tourograph might also be the first American dry plate magazine camera. The evidence is definitely compelling and it appears to be true. Image courtesy of Jerry Spiegel. The first dry-plate Tourograph was introduced c.1880. It had a sliding 2-door front. Sometime during 1882, the single door model shown on this webpage replaced the 2-door body pattern.single door model. No examples of the improved Tourograph have been identified.